A machine learning toolbox tailored to healthcare data. # > Models tuned via 5-fold cross validation over 10 combinations of hyperparameter values. Version 1 of healthcareai has been retired. You can continue to use it, but its compatibility with changes in the R ecosystem are not guaranteed. You should always be able to install it from github with: install.packages("remotes"); remotes::install_github("HealthCatalyst/[email protected]"). healthcareai now depends on recipes 0.1.4 and caret 6.0.81. You will need these versions or later. Various hidden changes were made to be compatible with these packages' lastest breaking changes. bagimpute in prep_data now accepts bag_trees to specify the number of trees. This is updated to be compatible with recipes 0.1.4. Local loaded healthcareai library versions now are saved to model objects. Explore a model's logic with explore. Make counterfactual predictions across the most-important features in a model to see how those features influence predicted outcomes. plot method to visualize a model's logic. Identify opportunities to improve a patient's outcome with Patient Impact Predictor, pip. Carefully specify variables and alternative values that exert causal influence on outcomes; then get recommended actions for a given patient with expected outcomes given the actions. Predict outcome groups based on how bad false alarms are relative to missed detections (outcome_groups argument to predict). Group predictions into risk groups using the risk_groups argument to predict. 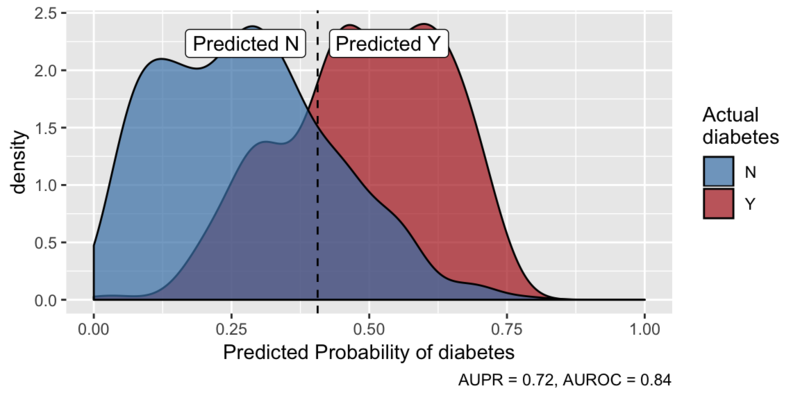 plot support for outcome- and risk-group predictions. Get thresholds to split outcome classes to optimize various performance metrics with get_thresholds. plot method to compare performance across metrics at various thresholds. split_train_test can keep multiple observations of an individual in the same split via the grouping_col argument. Replace values that represent missingness but have been interpreted by R as strings with NA with make_na. If missingness finds any such strings it issues a warning with code that can be used to do the replacement. Add counts to factor levels with rename_with_counts. summary.missingness method for wide datasets with missingness in many columns. In prep_data, trigonometric transformations make circular features out of dates and times for more informative features in less-wide data frames. Fixed AUPR in plot.model_class and summary.model_class. Can specify performance metric to optimize in machine_learn. Predict on XGBoost models now works for any column order in the new dataset. Regression prediction plots are plotted at 1:1 aspect ratio. add_best_levels works in deployment even if none of the columns to be created are present in the deployment observations. prep_data can handle logical features. outcome doesn't need to be re-declared in model training if it was specified in data prep. No longer support training models on un-prepped data. No longer support wrapping caret-trained models into a model_list. Identify values of high-cardinality variables that will make good features, even with multiple values per observation with add_best_levels and get_best_levels. glmnet for regularized linear and logistic regression. interpret and plot.interpret to extract glmnet estimates. XGBoost for regression and classification models. variable_importance returns random forest or xgboost importances, whichever model performs better. predict can now write an extensive log file, and if that option is activated, as in production, predict is a safe function that always completes; if there is an error, it returns a zero-row data frame that is otherwise the same as what would have been returned (provided prep_data or machine_learn was used). Control how low variance must be to remove columns by providing a numeric value to the remove_near_zero_variance argument of prep_data. Fixed bug in missingness that caused very small values to round to zero. Messages about time required for model training are improved. separate_drgs returns NA for complication when the DRG is missing. Removed some redundent training data from model_list objects. methods is attached on attaching the package so that scripts operate the same in Rscript, R GUI, and R Studio. Minor changes to maintain compatibility with ggplot2, broom, and recipes. A whole new architecture featuring a simpler API, more rigor under the hood, and attractive plots. Limone -- a lime-like model interpretation tool. Deploy now saves information about the model and deployment as an attribute of the output dataframe. This information is written to a log file in the working directory. skip_on_not_appveyor will skip a unit test unless it's being run on Appveyor. Unit tests involving MSSQL now only run on Appveyor. skip_if_no_mssql isn't needed as a test utility anymore. Multiclass functionality with XGBoost is supported using XGBoostDevelopment and XGBoostDeployment. K-means clustering is supported using KmeansClustering. findVariaion will return groups with the highest variation of a chosen target measure within a data set. variationAcrossGroups will plot a boxplot of variation between groups for a chosen target measure. SupervisedModelDeployment no longer trains models. It only loads the model saved in SupervisedModelDevelopment. Predictions are made for all data. SQL tools now use a DBI backend. We support reading and writing to MSSQL and SQLite databases. SQL tools are now common functions used outside the algorithms. Model file documentation files now accurately reflect the available methods. testWindowCol is no longer a param in SupervisedModelDeployment or used in the algorithms. writeToDB is no longer a param in SupervisedModelDeployment or used in the algorithms. destSchemaTable is no longer a param in SupervisedModelDeployment or used in the algorithms. generateAUC now calls getCutOffs to give guidance on ideal cutoffs. getCutOffs now generates list of cutoffs and suggests ideal ones. API changes for both functions.